Recently an IT company asked me to take a look at its website with a view to improving the structure and copy. So I undertook a thorough review of the website. Now, I’m a bit of a geek, but, although I “understood all of the words” on the website, I came away with the feeling that I didn’t really understand what the Company did and who they did it for. I met with the MD and he said he would explain it all to me (which of course, shouldn’t be necessary and rather defeats the object of having a website). So we sat together behind a computer and looked at his website. After a minute or two, he said, “Hmm, I see what you mean.” As the owner of the Company and the person who had created the website, he was so involved and familiar with the Company and its products and services that he had not taken a cold look at the content through the eyes of a potential customer. As a result, no clear value proposition was articulated. Having found the Business Model Canvas approach of Osterwalder and Pigneur useful in my role as a Growth Coach for the Business Growth Service, I suggested that it would be very helpful if I led us through their Value Proposition Development (VDP) process. So we spent two afternoons locked away with a laptop, flipchart, marker pens and PostIt notes! We followed the VPD process for each of the Company’s two target segments: IT vendors and IT resellers. The “things” the client does for his customers that remove pains and add gains. The value that this brings to his customers. To test the veracity of our conclusions, I held confidential conversations with a key customer in each segment. These conversations verified that our thinking was spot on. I then used these conclusions to develop value proposition statements and key messages for each statement. These were then used to develop the new copy for the client’s website and other marketing materials. Analysing the business’s value proposition and developing simple, powerful statements about its capabilities and the value it brings had a rather unexpected immediate business benefit! When discussing the value proposition with the Company’s IT Vendor customer, he said, “I didn’t know they could do that, I’ll contact them about a joint marketing programme.” So my client benefitted from a new marketing opportunity with a significant IT vendor. Google “value proposition” and you will find numerous definitions. Many revolve around something like “The value proposition defines the benefits your customers can expect from your products and services.” In my opinion, this is not good enough; it’s not just about the benefits they can expect. Many of your competitors will offer similar benefits. It’s about – why they should choose you over the others. 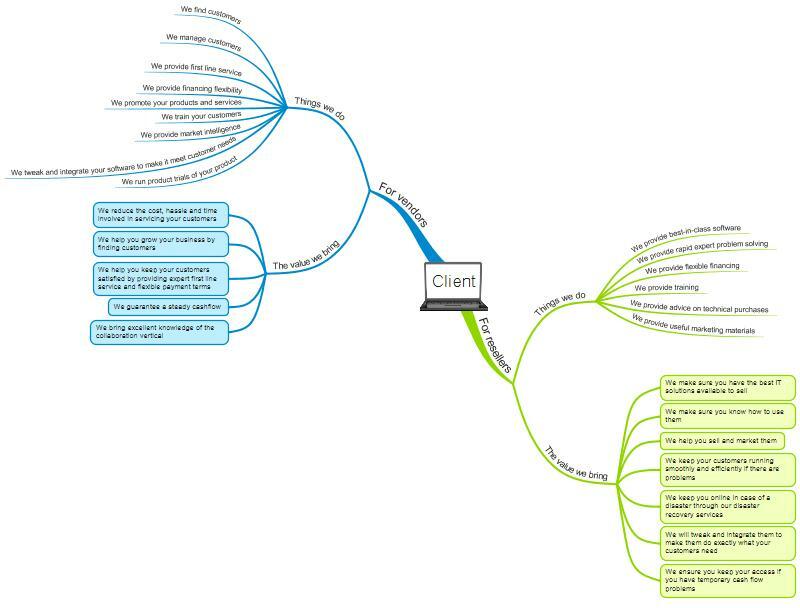 The “things the client does for his customers and the value it brings.